Earlier this year, we asked 25 FBC Members to come up with a variety of holiday-inspired recipes to showcase CW by CorningWare. And boy, did they deliver with a collection of recipes for all occasions. 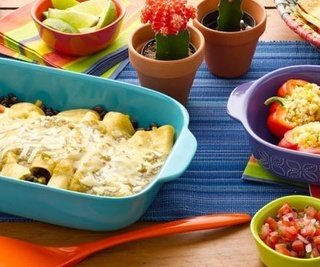 In addition to the fun CW colours, it's the same trusted CorningWare pieces that have the ability to go straight from the oven or microwave and directly to your table. We'll be featuring five recipes at a time in the slideshow below. First up, sweet treats for everyone to enjoy! Click on the photo and it'll bring you right to the recipe, enjoy! Don't forget to RSVP to our #CorningWare Twitter Party on November 18th, 2015 at 6pm PT/9PM ET for a chance to win some terrific CorningWare packages!